Congress must still approve the renegotiation of the trade partnership between the United States, Mexico and Canada. BUENOS AIRES, Argentina — The leaders of the United States, Canada and Mexico signed a new trade agreement here Friday, a development that President Donald Trump called "a truly groundbreaking achievement." The USMCA pact, largely a modernization of the nearly 25-year-old North America Free Trade Agreement, still must be approved by Congress — a potential challenge for Trump because Democrats take control of the House in less than five weeks. Leading Democrats have said they are worried that the deal doesn't include strong enough enforcement mechanisms for provisions aimed at supporting labor and conserving the environment. "For the new trade agreement to receive a majority support in Congress — including from members like myself, who have long opposed NAFTA and demanded improvements — it must prove to be a net benefit to middle-class families and working people in our country and must have strong labor and environmental protections, which in the present deal are too weak," Senate Minority Leader Chuck Schumer, D-N.Y., said in a statement. U.S. Trade Representative Robert Lighthizer said the administration would work with Congress on possible sidebar legislation aimed at assuaging lawmakers' concerns. "The negotiations are not going to be reopened, the agreement has been signed," he told reporters here. "We still need to put together an implementing bill so there are things that we can do. But I want to remind everyone that this was negotiated from the beginning to be a bipartisan agreement. ... It was the president’s instruction to me from the beginning that he wants a bipartisan agreement." 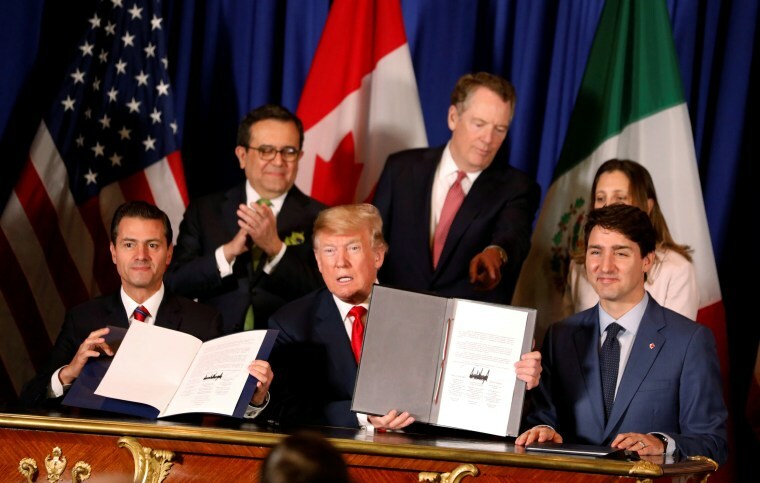 Trump, Mexican President Enrique Peña Nieto and Canadian Prime Minister Justin Trudeau took turns praising the pact's market access provisions, as well as its labor and environmental standards, before sitting down at a table to affix their signatures to the deal. "All of our countries will benefit greatly," Trump said at the signing ceremony, which was held on the margins of a G-20 summit here. The renegotiation of NAFTA was one of his campaign pledges, and he and his aides worked hard to push Canada to the negotiating table. At times the the long-standing alliance between the two countries has been severely tested. Trump called Trudeau "very weak & dishonest" in a tweet sent as he departed a G-7 summit in Quebec in June. And there are still sore points in the trade relationship — most notably, stiff tariffs on certain metals. "We need to keep working on removing the tariffs on steel and aluminum," Trudeau said. Earlier, Peña Nieto, who is leaving office, awarded Trump's son-in-law, Jared Kushner, the "Order of the Aztec Eagle" for his work on the trade deal. Now, the efforts of the administration and its allies will turn from the international negotiating arena to Capitol Hill. Jay Timmons, president and CEO of the National Association of Manufacturers, lauded the agreement.